Impress family and guests with your great taste in pine deck chairs and picnic table sets! 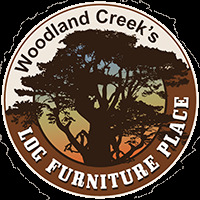 Whether yours is a Bar-B-Q crew or a sun-worshiping bunch, Woodland Creek’s has outdoor pine furniture built with you in mind! 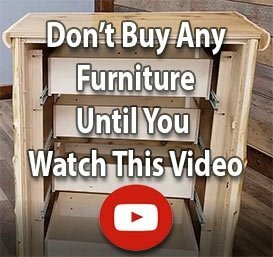 We have western furniture, country furniture and rustic furniture options that are sure to impress even the pickiest family members and guests. Browse everything from handcrafted pine benches to one-of-a-kind pine yard swings made of naturally fallen hardwood. Why not give our Montana log patio tables and Glacier Country log porch swings a whirl? Country decorating for the porch and the garden has come a long way! Today’s home, lodge and cabin log furniture makes the most of rustic decor for the outdoors. Do you like a “raw” log furniture look? Browse our North Woods line. If you find a weathered affect more appealing, look for Montana pine swings and more. Get a bit of both with Glacier Country cottage furniture. Good things come in 3s … plan your perfect outdoor furniture trio with help from Woodland Creek’s. Small, medium, large. Good things often come in 3s, don’t they? Achieve rustic decorating balance by turning to Woodland Creek’s for wood furniture trios that stand out for all the right reasons. Offset a stately pine rocker with a solid pine chair and visually join them with a pine end table. Place a pine glider perpendicular to a pine log loveseat and plunk a sturdy pine side table nearby.